The InLove setting features a refined, slim halo of diamonds located just under the top of the center diamond as well as an ultra thin diamond band, which sits flush with any wedding band. By design, this ring also may accommodate many stackable bands as well! Amethyst has been valued for years for its association with Royalty and historically, in Europe, it was considered to be a precious gemstone. Amethyst is the February birthstone and this ring would be perfect for the February baby in your life. 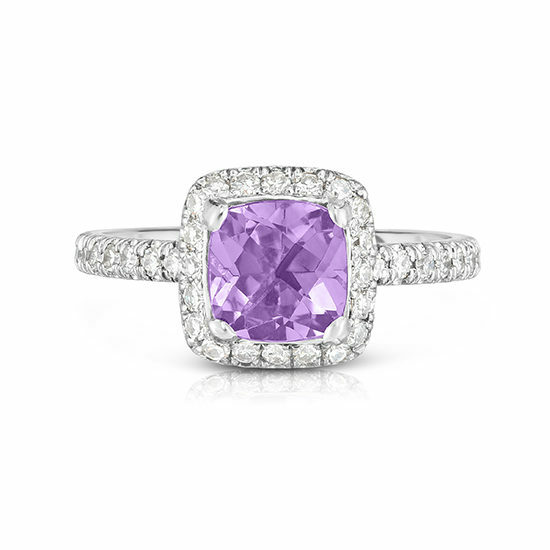 This ring was meticulously handcrafted in New York City from a piece of solid platinum and built around the 1.30 carat Cushion cut Amethyst center stone. Each diamond in the ring was handset, under a microscope, by a master stone setter. Available for purchase online after payment is received in finger sizes 4.5 through 7. Ships within 5 business days of confirmation of payment. In stock in size 5.25. Available to custom order in any finger size and carat weight. For custom orders please call 212.566.8977 or email [email protected] We look forward to creating your perfect ring.